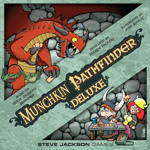 Daily Illuminator: Munchkin Pathfinder Deluxe: Out Soon! July 30, 2014: Munchkin Pathfinder Deluxe: Out Soon! Working with Paizo to make Munchkin Pathfinder has been one of our favorite partnerships . . . and now there's a deluxe edition coming out! It's the same great game! It includes a board and standees to help you track your Level, and of course all your favorite monsters from Golarion . . . including more Goblins than any sane person could want. If you've been holding off buying Munchkin Pathfinder, you can't beat the value in Munchkin Pathfinder Deluxe! It's shipping from our main warehouse now, so you'll be able to buy it at your Friendly Local Game Store very, very soon.